The Spectra Precision FOCUS DL-15 digital level is a very affordable digital level delivering simplicity, ease-of-use and versatile onboard software to provide consistent precision, performance and productivity. It provides consistent height measurement precision through electronic reading of a standard bar code staff to an accuracy of 1.5 mm (0.005 ft.). Featuring internal data storage and a distance measurement range of 100m (328 ft.), the Spectra Precision digital level is affordable, versatile, and easy to use, an ideal choice for value. 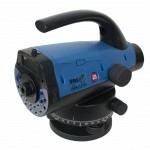 Easy to learn and use, instantly productive, the FOCUS DL-15 provides consistent measurement precision. It eliminates reading and recording errors and reduces operator eye fatigue. Use on a wide range and variety of tasks requiring precise height determination. It enables the user to initiate a measurement and record the data at the push of a button. The FOCUS DL-15 contains measurement routines for common leveling tasks including height determination, calculation of elevations, height differences and Cut and Fill Stakeout. Simple data transfer from the FOCUS DL-15 via USB cable. Internal Data Storage and Easy Transfer. Features rechargeable Ni-Mh, 4.8 V, 2100 mAh with operating time (x2 batteries) of approximately 20 hours.